Origin: Native to northeast U.S., Canada. Eastern arborvitae is a relatively common landscape tree in the eastern half of Nebraska often used in foundation plantings and as screens along property lines. Mature trees may reach 30-40’ in time, but in cultivation typically grow only 10-25' tall, depending on the cultivar used. It commonly grows in cool, moist, nutrient-rich sites. One should avoid abnormally dry areas or be prepared to water this tree during dry periods. Ideally, it likes moist soils and many sources say it also prefers considerable atmospheric moisture. It also can thrive in compacted soils and can be transplanted any time of year. It is most often used for hedges and other types of border or shelter plantings. Suitable to plant throughout the state, but shown to thrive in eastern Nebraska. The tree's crown is narrowly conic to broadly pyramidal, with spreading, densely crowded branches. Cones may be produced by the trees as young as 6 years old, but seed production in large quantities begins when the trees are about 30 years old. The tree provides food and shelter for a variety of animals including birds and small mammals and is highly preferred by white-tailed deer for both shelter and browse. The wood’s light weight and resistance to decay make it useful for a number of applications. The principal commercial uses are for rustic fencing and posts. However, cabin logs, lumber, poles, and shingles can also be created from the tree. Other than occasional bagworms and spider mites, the species has no serious insect or disease problems. Foliage may show some winter burn on exposed sites. Narrow cultivars are especially susceptible to bending and branch-snapping in ice and wet snow events. 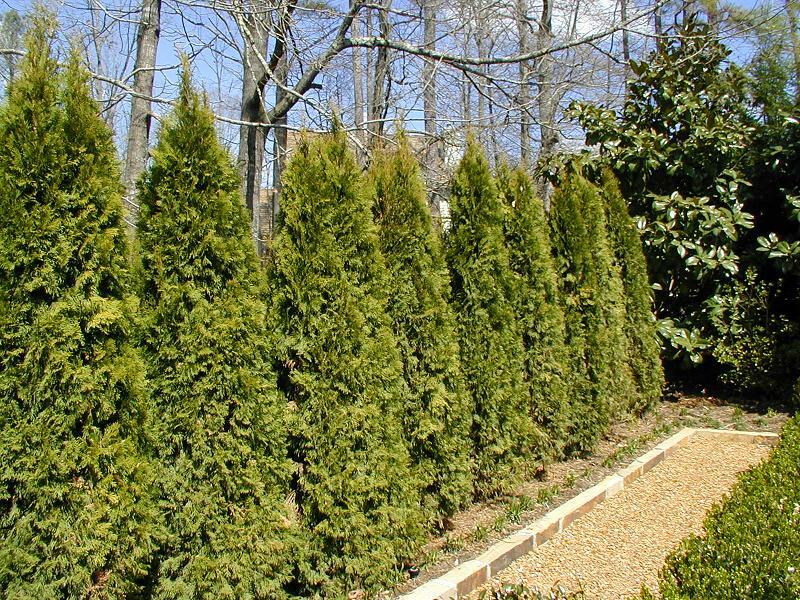 The very similar Western Arborvitae (Thuja plicata), including the cultivar ‘Green Giant’, is native to the northwest U.S. and has been planted in the region but is considered to be less reliable. False Cypress, including the Japanese native Sawara Falsecypress (Chamaecyparis pisifera) resembles arborvitae and is occasionally encountered in Nebraska. Arborvitae translates to “tree of life.” It comes from early settlers to North America who learned from Native Americans that the tree’s foliage could be used to treat scurvy.